When looking at possible venues for your event it is best to research all the factors that are going to contribute to your event being a success. Many venues have associations with different genres of music so take a look which bands have played there before. Once you get an idea of where similar bands, to those playing at your event, have been then you can move onto other important factors. Location is important because people need to get to the venue, somewhere out in the sticks isn’t going to be a great idea if you have relatively unknown bands because people won’t travel. You need to look at busy areas where there is the chance people will come in off the street, somewhere close to transport with parking nearby. The easier it is for someone to get to your venue the more likely they will be to come even if they’ve never heard of the bands that are playing. 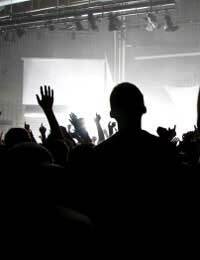 You also need to think about capacity, if you book a venue that is too big then the room is going to look empty which affects the bands’ moral on stage and the audience will feel exposed. Choose a venue too small and you may be at risk of selling out too early and miss out on those extra ticket sales. Look into the people you expect to come along, how many will the band bring, how many tickets have already been sold, what has been the feedback from others about the idea of the event? You will need to know if a venue has certain policies when it comes to you being able to book their venue. You’ll need to ask the term and conditions, some bars just ask for a minimum bar bill and then if this isn’t reached you pay the difference, some charge a one off fee for the room hire, and some will take a percentage of door takings. Some venues might even mix a few of these together; make sure you know what you are paying for before agreeing to anything. Most venues will require a deposit up front if you have to pay for them, they will then have the rest paid to them on the night of the event. Agree how this is going to work over the phone, so once they send you any contracts or forms to fill out, you know exactly what your options are. When looking at contracts read them through thoroughly, most will be pretty straight forward but just make sure that the lighting guy you hired for free doesn’t charge for light usage etc. If you don’t have your own sound and light people then a venue generally does or can get some for you. A lot of sound technicians come free with the venue when you book it but make sure you have the right amount of people there at all times so you aren’t stuck running the desk yourself or having to hire someone last minute for £50 an hour. The main thing to think about when booking a venue is forward thinking and planning. If you know exactly what you need from your venue before going out and researching then your job will be a lot easier.